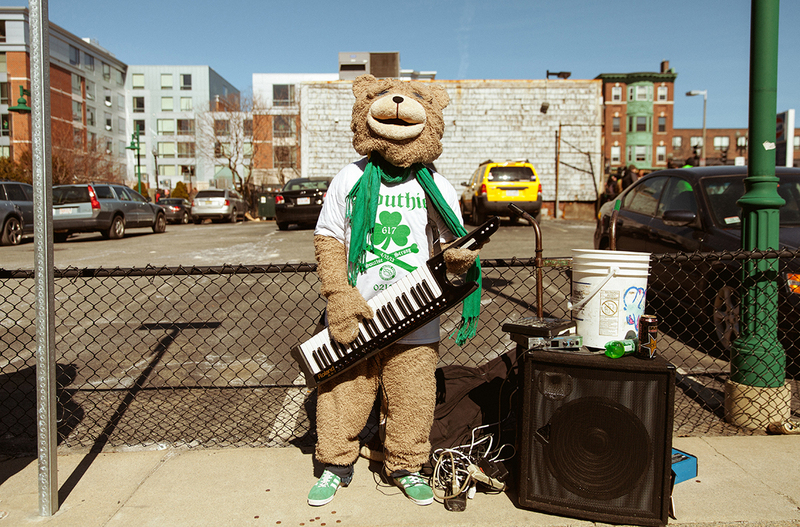 Draped in green, Boston’s darling Keytar Bear came out to Southie for this year’s festivities. We knew that Keytar Bear, the unofficial musical mascot of the city, was going to hibernate for a while this summer, but we had hoped it would be on his own terms. According to the keytar-playing man in the bear costume, two separate assaults that recently occurred—one apparently near Faneuil Hall—have kept him from making any recent appearances at his regular busking spots. “People are gonna have to wait [two] weeks to a month before I go out into the streets,” a message from the anonymous Keytar Bear said. Apparently, Keytar Bear is under the impression that the same individual attacked him on two separate occasions, but he can’t be entirely certain. In a message sent to Boston, he said during the first altercation the alleged suspect threw a Snapple bottle at him, breaking his instrument, before running off and taunting him from afar. The second time, however, it got “personal.” He told us that the suspect involved in the second assault put his arm around Keytar Bear and went to take a selfie, before smashing the man in the costume in the nose and running away. “[I] gushed [through] the mouth of the bear suit and right in front of Faneuil Hall with cameras both facing the incident and the direction he ran off [to],” he told Boston, adding that the suspect broke his nose. We reached out to Boston Police officials to ask whether a report was filed, or if officers were called to the scene of the alleged attack, but did not immediately receive a reply. Last month, in a rare interview, Keytar Bear talked about how sometimes people would bother him while he performed at MBTA stops and stations—mostly younger kids—which prompts him to often take some time to reload until the crowds disperse, so he can play songs for his more grateful fans. There’s no indication that this is what happened recently, but Keytar Bear said “he won’t be around” for an undetermined amount of time. Within an hour of the news surfacing, fans of the bear started to come to his aid. Abigail Taylor started a Facebook page to organize a fundraiser for the performer to offset some costs while he’s out of commission. “As Bostonians, we are responsible for putting a smile back on his face. I’m hosting this fundraiser, not only to help out Keytar Bear with his bills, but also to show him what he means to the city of Boston,” she said. An Indigogo fundraiser was also set up in his name.